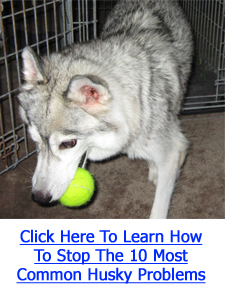 If you want to learn Husky crate training, you’re not alone. Crate training is an extremely popular and widely used method for keeping dogs confined in the house when you are away from home and can help to reduce anxiety, destructive behaviour and excessive barking. Not only is it an invaluable tool for helping with house breaking your Husky, it can also make your life easier if he insists on sleeping in your bed or on the sofa. If you are considering Husky crate training, know that most dogs, including Huskies love their crates. In the wild, canines seek out dens that are small, safe spaces for them to burrow into and to keep warm. A crate emulates such an environment, by giving them a safe space that is theirs alone. Also, dogs that have wide open spaces sometimes have trouble differentiating between their “home” and the space and will grow anxious trying to patrol or control the whole house. The ideal time to begin Husky crate training is when your Husky is still a puppy. An adult that has never been in a crate may have a harder time adjusting to the small space and may grow anxious. A puppy will also be initially upset but will quickly adapt to the crate. Also if your Husky was never given the option to sleep in your bed, he will never be upset about not having such an option in the first place. The best location for the crate is in a family room where many people will be in. At night, you may wish to put the crate in your bedroom when you are initially crate training your Husky in order to give him a sense of safety nearby. Eventually (in about a month’s time), you should be able to leave the crate in one place but for now, focus on keeping him feeling calm and safe. When placing your Husky in his crate, ensure that the space is clean and comfortable enough for him to sleep on. Also provide a source of water and a toy or two to play with. The crate should only be big enough for him to stand up, turn around, and lay down. If he can do all of those three things, the crate is comfortable enough for your Husky and is not inhumane. If the crate is big enough for him to walk around in, he will soil it. With Husky crate training, never let him out of the crate when he is upset, unless you know it’s for another reason (eg. He has to go potty). Doing this will only teach him that if he makes a fuss, he will get attention and will be allowed out of his crate. Only take him out of his crate if he’s been quiet for at least 5 minutes. You should then reward and praise him with a lot of attention and even a treat to reinforce the good behavior. At first, only leave your Husky in the crate for short periods of time (an hour or two at most). As he gets older, increase the time gradually but avoid confining him for so long that he is forced to soil his crate, as this can really set back house training. Learning proper Husky crate training will ensure that your Husky never gets too loud, destructive or anxious while you’re away from home. Puppies will adapt the quickest to a crate and are less stressful to crate train.